For Kinect on the Xbox 360, a large amount of the successful games that we saw were based around fitness. While we haven’t really seen a “killer app” of sorts for the Xbox One and Kinect 2.0, it appears that Microsoft does have one last trick up its sleeves: Xbox Fitness. A page that leaked on the official Xbox website shows the very first details for what looks to be an impressive service. 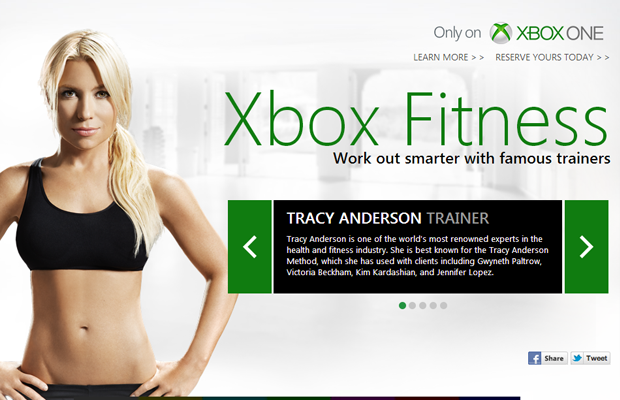 Trainers such as Tracy Anderson, Tony Horton, Jillian Michaels, and Shaun T are all listed on the Xbox Fitness landing page. P90X and Insanity were also name dropped, and appear to be included in what seems to be a year long trial of the service. The information does appear subject to change, but it would be an incredibly impressive move for Microsoft to announce this app for Kinect 2.0 on the Xbox One. There seems to be a portion of consumers that highly enjoy the fitness apps on the Xbox platform, and a partnership with trainers of this caliber will certainly help sell the Xbox One. With this appearing to be a year long trial of the service, you have to wonder what the price will be for all of this content when it’s no longer free. What do you think about Xbox Fitness? Would you be willing to give it a shot if it is in fact included for free with Xbox Live Gold? Be sure to let us know what you think by leaving us a comment below, or continue the discussion on Facebook and Twitter.